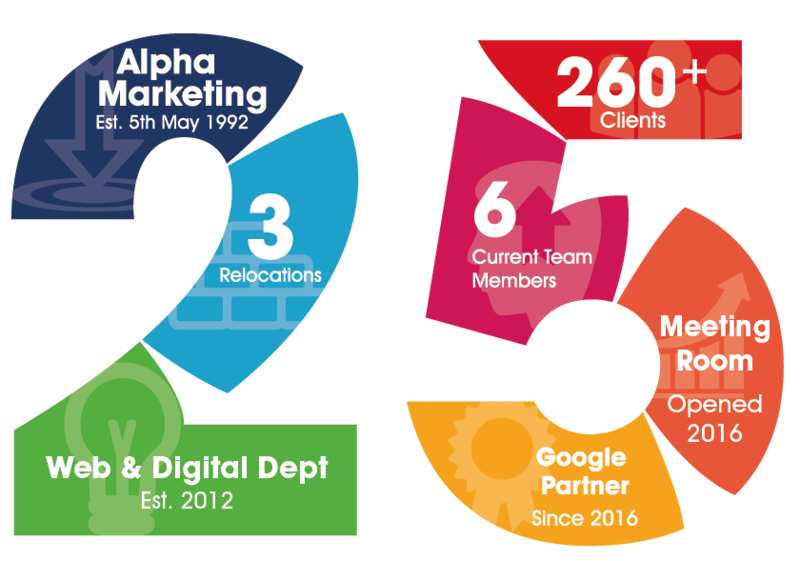 On 5th May 2017, Alpha Marketing marks 25 years in business. During the past quarter century we have served more than 260 clients, several of whom have been customers from the very start. In 2012 Alpha expanded to offer website development and digital marketing and became a Google Partner in 2016. For 25 years Alpha Marketing have specialised in providing local businesses with high quality marketing across online and offline marketing using a variety of both traditional and contemporary methods including marketing, website design and development, graphic design, branding, email campaigns, search engine optimisation and PPC advertising management. Then there's print and procurement services, clothing, point-of-sale mateirals and branded promotional items, displays and exhibitions, events, advertising and much more. Basically, if it has a logo on it, we can produce it! The hands-on, one-stop-shop marketing, design and web agency! We're not interested in slowing down – it's full steam ahead for the next quarter century and we're looking forward to working for our clients and growing the Alpha Marketing family. If you have any questions about how our wide range of services can help your business grow, please get in touch today – we'd love to meet you and share our vast experience. Here's "Cheers!" to another successful 25 years!